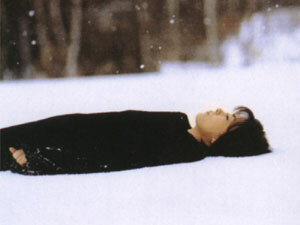 Miho Nakayama takes a nap. The Skinny: A grieving woman writes a letter to her deceased fiancé and, to her surprise, receives a response in this winning film about love lost, regained, and finally discovered. Sentimental and ultimately cathartic, this multiple award-winning drama lives up to its stellar reputation. It has been said that "time heals all wounds." But as director Shunji Iwai's nostalgic Love Letter demonstrates, time isn't always enough to make the grief go away. Sometimes, it takes persistence, caring friends, and maybe a simple twist of fate just to get things moving. In this elegantly told tale, Miho Nakayama portrays Hiroko Watanabe, a young woman living in Kobe who finds that she still hasn't fully recovered from the loss of her beloved boyfriend, Itsuki Fujiii. While meeting with Itsuki's mother on the second anniversary of his death, Hiroko happens upon Itsuki's old junior high yearbook, the one he received back when his family lived far away in Otaru, Hokkaido. Inside the yearbook, she finds a list of the students' home addresses, and when her former mother-in-law to be is out of the room, she surreptitiously copies her fiancé's old address down on her forearm. However, the old house that the Fujiii's lived in has been torn down in the intervening years, all to make room for a freeway. But the lack of a real physical address isn't a problem for Hiroko; it's the symbolism that matters. As such, Hiroko writes a short, simple letter to Itsuki - "Dear Itsuki Fujiii. How are you? I am fine. Hiroko Watanabe" - and mails it to the presumably nonexistent address. Sounds like a simple attempt at closure, right? Wrong. Miho soon receives a response - from Itsuki Fujiii! With a plot twist like that, one might guess that Love Letter is about to venture into some heavy-duty sci-fi/fantasy territory. But that's not what happens at all. It seems that Hiroko's letter was delivered to another Itsuki Fujii, a women of about the same age as Hiroko who just so happens to share the same name as her fiancé. This Itsuki Fujiii is both creeped out and a little curious about the letter and decides to respond in a similarly ambiguous manner, never revealing that she's actually a woman. So no, Itsuki Fujii's response isn't a letter from heaven. Even so, there is one thing that remains perplexing about the whole situation. Miho Nakayama also plays the role of the female Itsuki! Confused? Don't be. It's not a case of alternate realities or magical realism at work here, although there is much magic to behold in the entirety of the elegiac, yet hopeful Love Letter. Still, the stunt casting and resultant resemblance between the two characters is intentional, a secret which will be revealed as the narrative unfolds. Along the way, however, a first clue is given - not only did the two Itsuki Fujiis attend the same school, but they were also in the same class and knew each other. In any case, numerous misunderstandings occur early on in the women's correspondence, but once everything's cleared up, Hiroko's patient boyfriend-in-waiting, Shigeru Akiba (Etsushi Toyokawa), encourages her to leave Kobe and head for Otaru to meet her new pen pal. Shigeru is an old friend of the male Itsuki and hopes that this journey will allow Hiroko to finally get over her grief and give their relationship a chance. But it isn't all about catharsis. As Hiroko searches to know more about Itsuki as a young man, the "other" Itsuki is given a chance to reflect on her own past and exactly what her connection to her male namesake has not only meant, but may still mean to her all these years later. What Hiroko and Itsuki find out by story's end marks a new beginning for both of them in vastly different ways. In taking on her dual roles in this well-liked film, starlet Miho Nakayama achieves a rare acting feat: she actually steals the movie from herself. The film begins as if it's going to focus on Hiroko and her journey towards some sort of catharsis. But while that plotline is certainly dealt with in a substantive way, the surprise of Love Letter is that it is really the female Itsuki Fujii that I found myself gravitating towards despite the dual plot. Not only is she a warmer and more accessible character than Hiroko, but there is much in her story for the audience to discover right along with her, a welcome quality that helps drive the story forward in an immediately engaging way. Nakayama does a stellar job in juggling these two roles, as the two characters never feel like carbon copies. In fact, Nakayama handles her roles so well that sometimes it even feels as if Hiroko and Itsuki were portrayed by two completely different actresses.